Monday is our first day on the job. After a brief orientation, each of the teams started began their work. 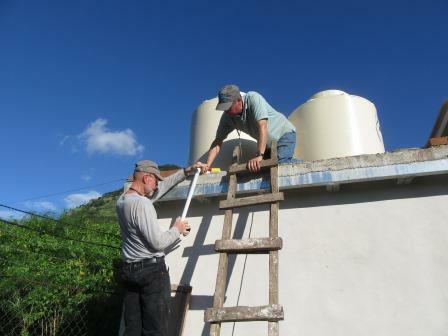 Before noon, the new tanks were on the roof and the board for the water system was bolted to the water room wall. 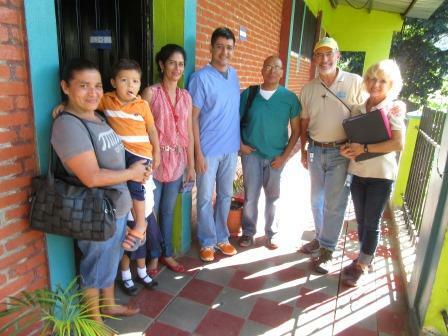 The educators and dentists went to the elementary school nearby (K-1 to K-6) and met with the principal. Then the power went out! Seriously? A local merchant agreed to loan us a generator for the week to get us through the week, but before we returned to the site, the power was back on. So, everything is great. Everyone is well. The food is great. A local chef with the Danli Iglesia Metodista Unida is cooking for us. Great progress has been made. The dentist has seen several children and we have fluoridated all fo the children in the school. There is pipe everywhere and the all of the educators are serious about learning Health and Hygiene.